In the photo, from right to left, are East Clinton seventh and eighth grade team members, cheerleaders and coach, front row, right to left, coach Todd Runyon and coach David Boris; middle row, cheerleaders right to left, Madison Johnson, Trinity Bain, Savannah Tolle, Autumn Smith, Lileigh Pauley, Emmy Chambliss, McKenzie DeBord; back row, right to left, Jordan Collom 7th, Jayden Murphy 8th, Lauren Stonewall 8th, Megan Hadley 7th, Megan Tong 8th, Ashlyn Tate 7th, Lauren Runyon 7th, Miranda Beener 8th, Abby Reynolds 7th, Lilly Hoskins 7th, Kami Whiteaker 8th, Libby Evanshine 8th, Jozie Jones 8th, Haley Purdue 8th, Madison Frazer 7th, Jade Campbell 7th, Lindsay Clutter 8th. The East Clinton seventh grade girls basketball team defeated Mt. Orab Monday 28-27 in an SBAAC Northern Division semifinal game at Western Brown. The young Lady Astros will face Goshen 5 p.m. Wednesday in the tournament championship game. Jordan Collom had 10 points, five rebounds, five steals and three assists. Megan Hadley had seven points, seven rebounds and four steals. Lilly Hoskins had five points, seven rebounds and three steals. Madison Frazer finished with four points, seven rebounds, two steals and two blocked shots. Lauren Runyon had two points, 10 rebounds, 10 blocked shots and two steals. 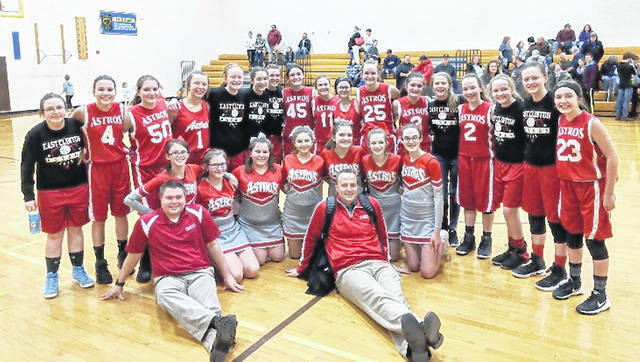 https://www.wnewsj.com/wp-content/uploads/sites/22/2019/02/web1_GBK_ecjrhigh-1.jpgIn the photo, from right to left, are East Clinton seventh and eighth grade team members, cheerleaders and coach, front row, right to left, coach Todd Runyon and coach David Boris; middle row, cheerleaders right to left, Madison Johnson, Trinity Bain, Savannah Tolle, Autumn Smith, Lileigh Pauley, Emmy Chambliss, McKenzie DeBord; back row, right to left, Jordan Collom 7th, Jayden Murphy 8th, Lauren Stonewall 8th, Megan Hadley 7th, Megan Tong 8th, Ashlyn Tate 7th, Lauren Runyon 7th, Miranda Beener 8th, Abby Reynolds 7th, Lilly Hoskins 7th, Kami Whiteaker 8th, Libby Evanshine 8th, Jozie Jones 8th, Haley Purdue 8th, Madison Frazer 7th, Jade Campbell 7th, Lindsay Clutter 8th.